To process claims with ACC, a Case with ACC claiming details needs to be created first in the Client Profile. Setting up a Case for ACC is the same as setting any other Case apart from ensuring ACC is set up as the Payer. An existing Case can be edited to become an ACC Case or a new Case can be created. Creating a new Case or editing a Case can be done from an appointment or from the Client Profile. Below explains how to Edit a Case to ensure all relevant information is added to claim ACC successfully. If you require further assistance to create a Case, see Creating a Case. 1. 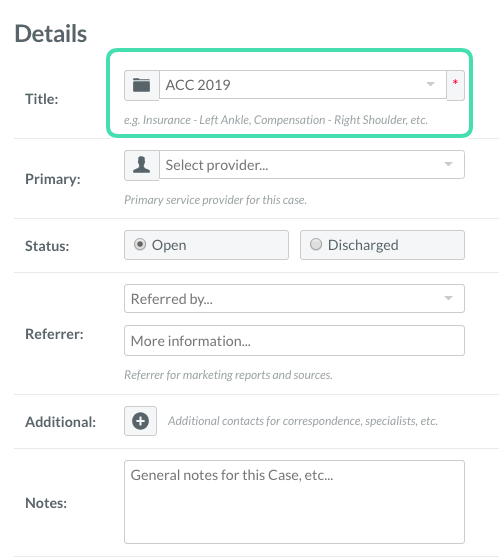 In the Case detail page, add a Case Title (Eg ACC 2019) to help identify the Case. 2. Under the Payers section, click on Add Payer. 3. Find ACC (Accident Compensation Corporation) in the Payer list or type ACC to sort and select it from the drop-down list. 4. Click Next to add the Payer. 10. Fill in the Case details as required such as referring GP, session approved by ACC for payment, injury date, expiry date. etc. 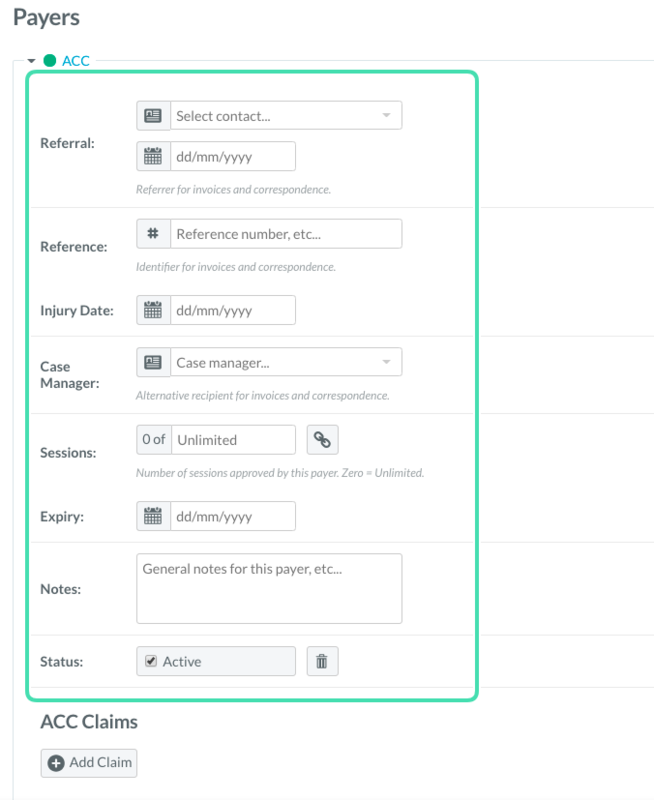 Once ACC has been added as the Payer, the ACC Claims section will be displayed below the Payer’s details meaning the Case is ready to have Pre-Submitted Claim or New Claim added to it. Click on the relevant link for more details.